Surprise your love with This addition of Heartfelt surprise. This is the best way if till your relationship don't have a deep feeling then by gifting flowers of bouquet you can express your love and feelings for your lovely person. 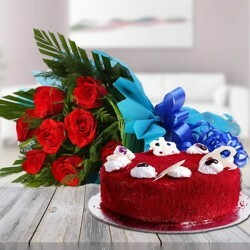 These beautiful red roses with delicious red velvet cake will surely leave your loved ones spellbound. All around in Jaipur, we are known for its best quality assurance and reliable delivery. It’s better to do it now then to regret for the rest of your life So, what you are waiting for don’t hesitate, tell her in the most special way with this heartfelt surprise. Content: Beautiful roses bouquet wrapped in paper with ½ kg red velvet cake. Colour of Flowers: 8 red roses. Propose her in the most beautiful way. Surprise your better half on your Marriage anniversary. Diabetic Should take special care while having red velvet cake. Keep the stems in water and maximise the life of bouquet. Delivered product might vary from the image shown above. Guarantees may not apply for timings like Diwali, Raksha Bandhan etc.